UPDATE #1 (07/12/07): Franklin County Commissioner Paula Brooks’ office has demanded that this matter be “investigated expeditiously”. Go here for more details. He oversees Central Ohio Homeland Security. He is a full-time teacher with the Columbus Public Schools. And in his spare time, he publishes articles praising the Al-Qaeda-backed Somali Islamic Courts Union (see also here). He’s Hilliard’s own Abukar Arman, and he is profiled yesterday at FrontPage, “Hometown Jihad: The Somali Terror Apologist Next Door”. Just how did Abukar Arman, a man with wildly extremist views, end up as the sole Columbus Public Schools representative on the Franklin County Criminal Justice Planning Board, which develops and oversees Central Ohio Homeland Security? That’s a question that hopefully our county commissioners and the CPS School Board will be answering shortly. 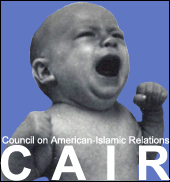 Did his friend and business partner, Ahmad Al-Akhras, one of Mayor Coleman’s closest advisors and Vice Chairman of the Council on American-Islamic Relations (CAIR — which was just named as unindicted co-conspirator in a HAMAS terror financing trial in Texas), have anything to do with it? And don’t you feel safer now knowing that someone who shares the violent ideology with Islamic terrorist and openly promotes them is in charge of your homeland security? And speaking of education, apart from his full-time teaching job with Columbus Public Schools (where he makes a whopping $32.73/hour), Abukar Arman also sits on the State Board of Education Foreign Language Advisory Board, a position he was appointed to back in March. Who was responsible for getting him that position? Was it his other friend and business partner, Abdinur Mohamud, who is a high-ranking official with the Lau Resource Center of the Ohio Department of Education? Oh, did I mention that Arman sits on the board of Sunrise Academy, the Islamic school in Hilliard that we recently profiled here at the COAT Blog, “Sunrise Academy’s Fundraising Friends,” and was the subject of a recent profile, “Hometown Jihad: The School Gym that Terror Built”? And that he’s a top official for the Islamic Society of Greater Columbus? BREAKING: Nuradin Abdi pleads guilty! Ahmad Al-Akhras on the Ropes?